Vectorworks, Inc. is a global design software developer serving the architecture, landscape and entertainment industries. The company offers CAD software in 2D and 3D designed to help designers communicate effectively and bring their visions to life while keeping building information modeling (BIM) at the heart of the design process. 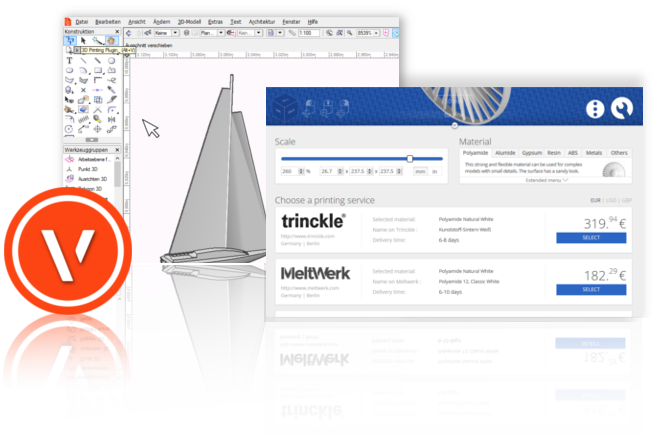 Install this free plugin to provide 3D printing to your entire BIM team directly from Vectorworks. Click the 3D print button to analyze and optimize your architectural models. Choose to have them printed in over 100 materials and instantly compare professional 3D service providers by cost and delivery time.